James Beard had first-hand experience as a captain in the Union army during the Civil War. 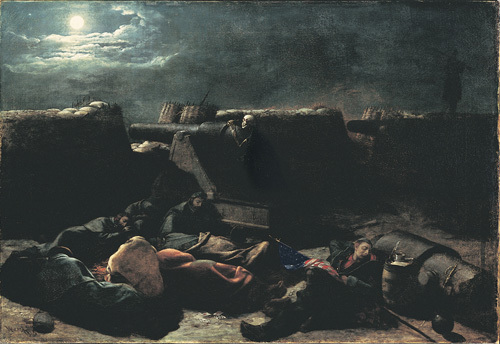 This painting, completed in the year the war ended, is a dramatic statement about the ever-present possibility of death on the battlefield. Were it not for details like the skeleton keeping vigil behind the cannon, the cruciform composition of the flag draped over the sleeping soldier, and the scattered playing cards suggestive of luck and chance, this painting would be a simple narrative about the Civil War. However, such potent symbolism imbues the work with layers of spiritual significance. Perhaps the reminders of death and sacrifice that the artist included in his masterful painting emerged from his firsthand experience in the Union Army during the Civil War. The meticulously selected and carefully arranged details attest to the poignancy of the soldiers' situation and contrast with the implied violence that will occur on the morrow.